The cruise giant closes out its fiscal year, and issues an outlook for the next one, on Thursday. Carnival (NYSE:CCL) has had mostly good news for investors in its last few quarterly reports. The cruise giant's business is on the upswing, after all, as demand rises even in the context of higher ticket prices. However, Carnival in late September predicted a significant growth slowdown for its fiscal fourth quarter that would likely persist into at least the first half of 2019. Those updated growth trends will be a key focus for investors when the company posts its fourth-quarter report on Dec. 20, and gives its official outlook for the upcoming fiscal year. Let's take a closer look at what to expect from that announcement. Carnival in late September revealed that net revenue yields, a core industry growth metric, expanded by 2.9% in the third quarter to mark the third consecutive time that its sales surpassed management's targets. The cruise giant outperformed in its Asian and European tours, and that success offset weakness in a Caribbean market that's still rebounding from back-to-back active hurricane seasons. The broader growth illustrates a key business advantage Carnival has over other vacation operators. Unlike hotel chains, it can easily reposition its fleet to reflect shifting global demand trends. For the current quarter, CEO Arnold Donald and his team predicted that growth would slow to between 1.5% and 2.5%. Sure, the company made a similarly conservative prediction earlier in the year that it went on to trounce. However, vacation bookings in this period are often made well in advance of travel and so Carnival's ticket revenue isn't likely to vary much from expectations. If the company outperforms, it might be thanks to robust onboard spending on perks like spa treatments and upgraded dining offerings. There are many moving pieces that Carnival has to balance in order to keep profits steadily moving higher, including ticket prices, cruise expenses, and the supply of rooms in a given market. The company has been doing well with this balancing act this year so that cruise costs are rising at a slower pace than net revenue yields. Look for that trend to continue into the fourth quarter as Carnival becomes more profitable. Keep a close eye on return on invested capital, which helps capture the broader financial efficiency of the business. That metric has more than doubled since 2014 and could soon cross into double digits. 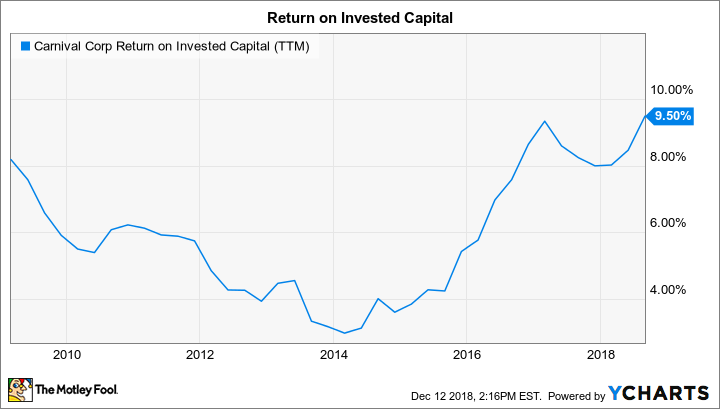 CCL Return on Invested Capital (TTM) data by YCharts. Looking ahead, Carnival should have a detailed update on 2019 expectations given the long advance purchase period for most vacations. As of late September, that outlook wasn't exciting, with bookings running at the same pace as last year at slightly higher prices. These trends suggested that growth would slow to below the 2% rate that management targeted for the fourth quarter. If confirmed next week, that prediction would imply a slowdown from 2018's roughly 3.5% boost, and that shifting trend helps explain why the stock is down this year despite generally strong sales and profit gains. Still, hitting those modest targets would produce plenty of cash that Carnival could direct toward upgrading ships and building the 20 new ships it plans to add to the fleet between now and 2020. Executives said in their last quarterly call that the cruise vacation niche is "both underpenetrated and capacity constrained." That's good news for the industry's biggest, most well-capitalized player.